The use of optical technologies in modern network scenarios has increased in the last decade, mostly due to their support in crucial networking topics (ie, bandwidth and scalability). In parallel, these scenarios have also experienced the emergence of a new paradigm recognized as software-defined networking (SDN), which bases on the decoupling of forwarding and control functions, with aims to provide a more efficient way to manage network resources compared to legacy networking architectures. As both SDN and optical technologies are constantly being introduced in different networking scenarios (eg, data centers, metro, and access networks), their coexistence becomes a must. In this matter, it is important to notice that SDN was initially designed for electronic-based networks; hence, its support for optical technologies is still at an early stage. Consequently, integration of both solutions still requires research efforts by the community. In this paper, we present a mechanism to address topology discovery in wavelength-switching optical transport networks (OTNs). In particular, we discuss the importance of the topology discovery function and analyse the proposed mechanism, which bases itself on the use of wavelength-specific signaling tones as link-binding data to provide preservice parallel link discovery in OTNs. Furthermore, we validate the method experimentally against an emulated OTN testbed with two different setups and compare the results to our previous work on this subject, achieving substantial reductions in the total topology discovery time. 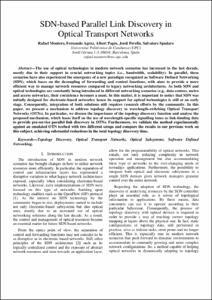 This is the peer reviewed version of the following article: Montero R, Agraz F, Pagès A, Perelló J, Spadaro S. SDN‐based parallel link discovery in optical transport networks. Trans Emerging Tel Tech. 2018;e3512. https://doi-org.recursos.biblioteca.upc.edu/10.1002/ett.3512, which has been published in final form at https://doi-org.recursos.biblioteca.upc.edu/10.1002/ett.3512. This article may be used for non-commercial purposes in accordance with Wiley Terms and Conditions for Self-Archiving. Montero, R., Agraz, F., Pages, A., Perello, J., Spadaro, S. SDN-based parallel link discovery in optical transport networks. "Transactions on emerging telecommunications technologies", 1 Gener 2019, vol. 30, núm. 1, p. 1-13.